What is it? 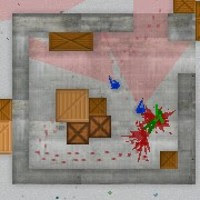 – Ultimate Assassin 2 is a top-down stealth-action game in which you’ll take on eighteen missions of assassinating heavily-guarded targets, and escaping undetected. Who made it? – The game was developed by Erman Haskan of Games121.com. How does it play? – Ultimate Assassin 2 is all about being patient, and striking from the shadows when your target least expects it. During each stage, you’ll need to kill your assassination target, highlighted in green. Once you’ve killed your victim, a level exit will appear. You’ll need to remain undetected to escape. Each map is also populated by a number of blue security guards. Their sight-patterns are represented by red cones of light emanating from each. Stray into one’s view, and they’ll quickly turn you into hamburger with a volley of machinegun fire. To help with evasion, your assassin also has two abilities at his disposal – limited super speed and invisibility – though you can’t move while invisible. The soldiers and your target will behave differently each time you play, so don’t expect to win via pattern memorization. If you’re spotted, they’ll do a pretty good job of hunting you down too, so be prepared to hide. You’ll need to strike when the opportunity presents itself. The exit for each level is also randomly generated each you play (and you can’t escape when the alarm is sounded), adding a welcome level of tension to your escape. Presentation – Visually, the game is pretty basic, and you view the action from a zoomed-out top-down view. All of the units are easily distinguishable, despite their small size, and the sound effects pack a nice punch. Positives – The “line-of-sight” mechanic is very well done, making the game superior to other similar games (Ninja Guiji). The random movement patterns of your foes and random exit locations also add a good amount of tension. Negatives – Due to the randomness of enemy movement and level exits, the difficulty can vary wildly from level-to-level, or even during consecutive playthroughs of the same stage. While the unpredictability is certainly a positive from a replayability standpoint, more casual players may be turned off by the difficulty. Why you should play it – I have yet to play a Flash game that harnesses stealth-action gameplay better than Ultimate Assassin 2. The enemies are challenging and smarter than average, and the level design is quite good. It may not be the shiniest toy to look at, but the gameplay is top-notch.